These are the lives of the sounds from the days of our lives. Samples, clips, pinches, and rips – the art of sonic appropriation is an intuitive process that begins in the gut, a conflation of time where a moment of sound jumps out and shakes your core, a moment where the universe aligns itself forming a cryptic revelation which the artist must capture and decode. (a(version)s) features original compositions from 10 sound artists who use sampling as an integral part of their practice. Their work spans a wide spectrum of approaches, dealing with intimate autobiographical references to over-arching archival systems exposing the politics of listening. Sounds steeped and inspired by their locale and history, politics and pressures, are defamiliarized – creating threads that are spatially ambiguous and future in their scope. 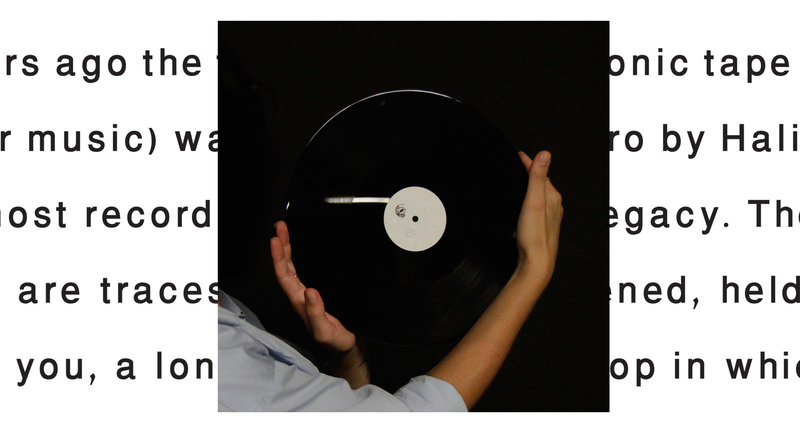 At the center of the installation is a dubplate record, which the audience is meant to play, to physically handle and audition the vinyl, an individual act filling up the space with sound. These sound works are not meant to be sold, all copyleft, its community based art, communally experienced sound. The space is designed to provide a sensorial sound experience, a kind of listening refuge amidst the cacophony of the market. This project was made possible in part with support from the Arab Fund for Arts and Culture and Ashkal Alwan. Cuchifritos is FREE to the public and handicap accessible. Located inside Essex Street Market at the south end nearest Delancey. Cuchifritos Gallery + Project Space is a program of Artists Alliance Inc., a 501c3 not for profit organization located on the Lower East Side of New York City within the Clemente Soto Vélez Cultural and Educational Center. Cuchifritos is supported in part by the New York City Department of Cultural Affairs in partnership with the City Council. This program is made possible by public funds from the New York State Council on the Arts and the National Endowment for the Arts. We thank the following for their generous support: Marie and John Zimmermann Fund, New York City Economic Development Corporation and individual supporters of Artists Alliance Inc. Special thanks go to our team of dedicated volunteers, without whom this program would not be possible.